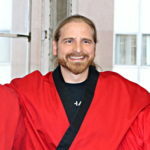 I have over 25 years of martial arts experience ranging from Shotokan, Karate, Tang So Doo, Muay Thai and Southern Shaolin Kung Fu. I’ve been teaching with Young Champions for over 10 years in Pasadena and Azusa and am honored to be a senior instructor with this amazing organization. My favorite thing about teaching is definitely the relationship building with the kids. Unlike an academic setting, I keep the same kids from year to year, from White Belt to Black Belt, from Child to Adult, and have the blessing of seeing them grow; and in many ways, helping them do so. My goals for them are high, and I actively help them attain them. Personally I’m a husband and father of 3, a huge superhero geek, a Catholic Christian, a board game designer (and publisher! ), and spend most of my free time playing with the kids.